1:33 That's my two planned trades today, so I'm done. Thanks for coming. See you next week. Take some courses. 12:35 one of my regulars has added a Chaos Trading Made Easy chart to the CCT room. Certified Chaso traders can share openly in that room. these set a congestion range. 10:19 now I need to think about a profit target - I'll try for 4 points so entering sell limit 1367. 9:26 on the MTRAinbow chart, the white 440 minute EMA is solidly up, so I expect today to be an up day. 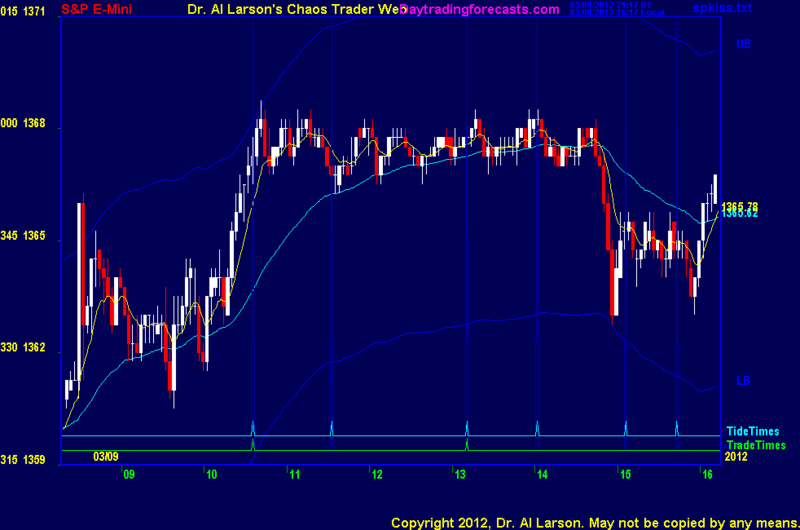 the major problem will be getting enough volatility, which as been low recently, with daily ranges about 9 points. 9:22 the past 2 days we have seen a good low near 10:30 Eastern, so I'll be watching for that today. 9:14 the 8:30 Employment Situation jobs report was a bit more bulish than expected, but not a big surprise. Hex Wheels , linked on the right side of ListOfCharts page, and the wheel on the HexWheelsToday page. This one involves Mars, Saturn, Pluto, Neptune, Chiron, Venus, and Jupiter. 3/9/2012 2:08:36 PM MT sdg:: Thanks BBB; see it on the site. 3/9/2012 1:50:53 PM MT BBB****:: Al sells (I believe) the software that computes the moontide times. I inquired about it awhile back and he told me to wait as he was working out some kinks (?) or upgrading it... but when the time comes I will most defintely be buying it. 3/9/2012 1:20:14 PM MT sdg:: I'll guess likely, with the moontide software. 3/9/2012 1:08:40 PM MT sdg:: BBB,JMV, other ****'s; Once completing the courses, do you have the ability to "trade on your own." In other words, when Al decides to permanently retire, can a CCT continue on without the newsletter subscription. Thanks. 3/9/2012 1:04:03 PM MT SSP:: lol i know but I'm looking for the 7 on the weekly spy too so maybe this triggers it ? 3/9/2012 11:26:56 AM MT BBB****:: I always figured that was the case, but never got clarification. Thank you. 3/9/2012 11:09:23 AM MT AG:: Today's tape exactly like Wednesday's. 3/9/2012 11:05:23 AM MT BBB****:: Al, just to clarify, the "continuation patterns" on the 20 EXMA is the series of little dips starting around 11.30 Eastern? 3/9/2012 10:37:59 AM MT SSP:: Trend is up but we might get a cross at the time window. Is there anything that wud make you take a short ? 3/9/2012 10:32:34 AM MT SSP:: Weather has gone spazzy here in Toronto today I guess its all flare related. 3/9/2012 10:21:23 AM MT BBB****:: Stuck a grid chart in CCT room - looking good. 3/9/2012 8:37:52 AM MT sdg:: First trade with you Al. Made money, but the bigger point is seeing the setup, taking the trade and controlling the downside. Look for my check next week. 3/9/2012 8:31:08 AM MT BBB****:: Nice trade Al! 3/9/2012 7:50:07 AM MT Tg****:: sdg, it's pretty common practice to move to the forward contract the 2nd Thursday of the appropriate month. 3/9/2012 7:42:56 AM MT sdg:: GM all - Al, reason behind June contract and not March? Thanks! 3/9/2012 7:24:19 AM MT Tg****:: Good day everyone. Xtide2plus really got the general shape of the past week right, didn't it.